Legs — yes, legs — are on the manifest for the next SpaceX Dragon flight. The commercial spacecraft is expected to blast off March 16 with appendenges for Robonaut 2 on board, allowing the humanoid to move freely around station. After some initial tests in June will come R2’s first step, marking a new era in human spaceflight. When installed, Robonaut will have a “fully extended leg span” of nine feet (wouldn’t we love to see the splits with that). Instead of a foot, each seven-jointed leg will have an “end effector” that is a sort of clamp that can grab on to things for a grip. It’s similar to the technology used on the Canadarm robotic arm, and also like Canadarm, there will be a vision system so that controllers know where to grasp. The robot first arrived on station in February 2011 and (mostly while tied down) has done a roster of activities, such as shake hands with astronaut Dan Burbank in 2012 (a humanoid-human first in space), say hello to the world with sign language, and do functions such as turn knobs and flip switches. During Expedition 34/35 in 2012-13, astronaut Tom Marshburn even made Robonaut 2 catch a free-floating object through teleoperation. 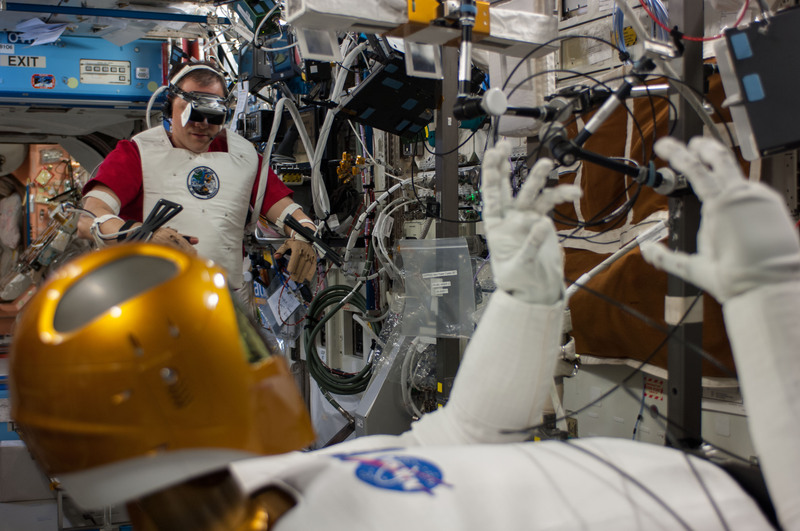 Eventually NASA expects to use the robot outside the station, but more upgrades to Robonaut 2’s upper body will be needed first. The robot could then be used as a supplement to spacewalks, which are one of the most dangerous activities that humans do in space. Closer to Earth, NASA says the technology has applications for items such as exoskeletons being developed to help people with physical disabilities. Where are the pointy ears? While high-return robotic explorers Oppy and Cassini risk premature termination, precious resources are devoted to this silly PR stunt ‘robot’. Oh the irony.